This is an EDITED version of my Wallpaper submitted for the APCLASH2010 Waldo Theme. Like I said, this is a diff. ver. of what I submitted. You will notice what I changed if you see my Waldo wall above. i don't like the wordings on the paper.. It's just great! although there is a little bright light but the whole scene reminds me of darkness.And if u put yourself into the picture u can see that the scenario is about a dark time of history when everything around is dark and fearsome. That what i feel when i have the first look of this. the black not only draw out the fear of us but make the main character looks more dark and cool. good job! I like this wallpaper! Especially for the atmosphere. It reminds me of something, maybe the horror movie, and the atmosphere somewhat fits for her perfectly. At least, she is really a jigoku shoujo, and it's like no one can save her from her destiny. 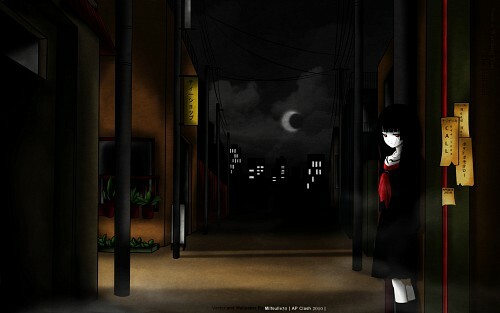 Because, she is alone in the small city, and I think there is no one too in that city.... That's very great job! And, it's out of topic, but I don't understand some parts in your artist's comment. The link of some web is disappear and I really hope I can see some the website.... But, yeah, it's crappy that you don't put the right BBCode for your artist comment. Cool, I like the dark ambiance.